When God made me in his image and likeness, he made me to be happy like him, as much as a creature can be; and, this is why he placed in me these three things, in me who was made to be happy, the idea of my happiness and the love or the desire of this happiness. There are three things which I find inseparable from me, since I do not exist without being something which was made to be happy. As a result I carry in myself both the idea of happiness and the desire to carry it out, which necessarily follow from this idea. When people ask me which of these three things I would rather lose, I do not know how to answer. Because first, I do not want to lose my being: I want, to say so, less to lose my happiness, as without happiness it would be better if I never was, conforming to this word of the Saviour about his unhappy disciple: It would be better if this man had never been. I do not want to lose my happiness more than my being, neither to more to lose the idea and the love of my happiness more than my happiness, as there is no happiness without this idea and this love. If there is something in me which has always been with me, it is this idea and this love of my happiness; because I cannot have ever been without fleeing that which harms me and to want that which is appropriate: that which can only come from the desire to be happy and the fear of not being. This sentiment begins to appear from childhood and as we carry this coming into the world, one should have this, although more obscurely and more muffled, from the womb of one’s mother. Here is an idea which is born in us and with us, and a sentiment which comes with this idea; and all this is in us before all reasoning and reflection. When reason begins to sprout, she does no other thing than to seek good and bad means to make us happy; that which shows this idea and this love of happiness is in the foundation of our reason. In a certain way, this idea which makes us know our happiness and this feeling which makes us love it, becomes in time our only idea and feeling. For the feeling, it is clear that all our other feelings relate to this one; and, as an idea, it follows that it is only to fulfil this one that we pay attention to all the others. Let us suppose that God gives us all and can also take away all which pleases him, then takes everything away, except for our being and the idea of our happiness and the desire which presses us to find it; we will be something very simple; but in our simplicity, we will have three things which will not divide our simplicity, but rather drive all three to its perfection. Then will we be happy? Alas not at all! We will only want to be and by consequence we will not be, as happiness cannot co-exist with need of which the desire is the proof. So what is necessary to fix all of this to make us happy? It is necessary to fix the confused idea that I have happiness, the distinct knowledge of the object where it consists, and at the same time to change the confused desire of happiness by the actual possession of what it is. But where can my happiness consist except in the most perfect thing which I know, if I can have it? That which I know to be the most perfect, it is doubtless God, since I cannot find in myself another idea of perfection other than God. It remains to know if I can have it. But what is having something, if not knowing it? Can it be had otherwise than knowing its perfection? I am thus capable of having it, since I am capable of knowing it, as long as in knowing it I am brought to love it, as to know it without loving it, is in effect to know it badly. After this happy addition which takes place at the knowledge and the idea that I have my happiness, will I be happy? Not at all. But why? I know and I love God and this in itself, we have said, is to have it: and this is to have that which I know best; and we have said that this is to be happy: thus where am I? Thus if I be happy, I will desire nothing; can I say that I have nothing to desire? Far from me be this blindness; I am thus not happy. Thus it is necessary to search in myself what I lack. I know God, I admit it, but very imperfectly; that which makes up my love for him is very weak, and from there also comes the weakness of wanting both good and bad things. I have the desire to know God more perfectly than I do: to know him, as Saint Paul says, as I am known; to know him without covering, to discovery, in a word to see him face to face, without shadow, without veil, without obscurity. When God repairs this, may he say to me as Moses: I showed you everything well; then I will say like Saint Philip, Master, it is enough for us. But this is not for this life: when this happiness comes to us, we will have nothing left to desire for his knowledge. But for love, what will this be? When we will see God face to face, can we make something more than to love? Doubtless no; and Saint Paul said that love lives eternally without ever being lost. So will our love be more in this eternal and happy state, unless it is perfect coming from a perfect knowledge? And he will not be able to change as he does in this life; and he will absorb all of our will into one which will be that of loving God and there will be no more wailing and our tears will be dried forever and our desires will come with our needs. Then we will be reduced to perfect unity and simplicity; but in our simplicity, we will carry the perfect image of the Trinity; then God, united at the foundation to our being and showing himself, will produce in us the happy vision which will be one sense God himself, he along being object as he is the cause. And by this happy vision, he will produce an eternal and insatiable love which will not yet be another thing but God himself seen and possessed; and God will be all in all, and he will be all in ourselves; one God alone in our depths, producing himself in us by the vision and completing himself in unity with us by an eternal and perfect love. Then our perfect unity will be accomplished in ourselves and will all those who have God with us; and that which makes us all perfectly one, that is what we will be and we will see and we will love, and all that will be in us all the same single life. And so what the Saviour said will be accomplished: As you my Father are in me and I in you, so they will be one in us; one in themselves and one with all the members of the body of the Church which they make up. Let us form in us the holy Trinity: united with God, knowing God, loving God: and as our knowledge, at present imperfect and obscure, will come; and that the love in us be the only thing which will never arrive and which will never be lost: let us love, let us love, let us love: let us do without end that which we will do without end in eternity. O that time is troublesome! The needs weighing down our time carry us! Who can endure the distractions, the interruptions, the sad necessity of sleep, of nourishment, other needs? But those of temptations, of bad desires, are they not as shameful as they are afflicted? Unhappy man that I am, who will deliver me from this body of death? O God, time is long, it is heavy, it bears down. O eternal God, take time away from me, fix me in your eternity! In waiting, make me pray without ceasing, and pass the days and nights in contemplation of your law, of your truths, of you yourself who is all truth and all good. Amen, Amen. God has possessed me, said Wisdom (Proverbs 8): that is to say, God has generated me in conformance to that word of Eve, when she gave birth to Cain and said: I have possessed a man by the grace of God. He has generated me, before doing anything else. I am ordered, and keep my rank through all eternity and from all antiquity, before the world was made: the abysses were not yet and I was already conceived. God gave birth to me in the hills: that is to say, before all time and all eternity, because there is nothing except eternity before all time. But does God only have wisdom which he generated? To God it does not please! because we we cannot produce in us our word, our interior word, if there was not in us a foundation of reason of which our word is the fruit: even more so, there is in God an essential wisdom, which was primitively and originally in the Father, which made him fruitful to produce in this womb this wisdom which is his Word and his Son, his word, his reason, his intelligence, his bubbling up to say so or the first pouring out of his heart and the only result who he made to truly name father before all time. It is from this, Saint Paul says, from which all paternity in heaven and earth comes. It is from there that to us is given, to us who believe in the unique Son, the power to be children of God in his image, in being born neither of blood, nor of the will of the flesh, but of God, who by his good and by the grace of his adoption has allowed us to associate with his unique son. It’s a little controversial, but I’ll say it anyway: I’m wishing my Iranian friends a Happy Nowruz. How Nowruz came about, and how I came to know my Iranian friends, are two interesting matters. Let’s start with the first: Nowruz, the celebration of the Vernal (Spring) Equinox, goes back to pre-Islamic times when Persia ruled the Middle East with such great emperors as Cyrus, Darius, Xerxes, Artaxerxes and the like. If they sound familiar to students of the Bible, they should: it was Cyrus who allowed the Babylonian exiled Jews to return to Jerusalem. In Islam these times are called al-jahiliya (the time of ignorance) but at least one of my Iranian friends would move that to another time in Iranian history. And how did I get these friends? I started my PhD in the Fall of 2011, and found myself “behind the 8-ball” in many ways. It was also the first semester for the group of Iranians in the program. The first class was a challenge for everyone, including the instructor, who gave as sad a half-time (after mid-term exam) speech as Derek Dooley ever gave the Vols. As the final exam approach, desperate for help, I turned to two of them for help, and they did: I probably wouldn’t have gotten through the course without them. Since those times I have gotten to know them better. To begin with, as witnesses as disparate as David “Spengler” Goldman and CBN News‘ George Thomas have pointed out, they are the most charming and sophisticated people in the Middle East. For a small example, in another class there was one other person from the Sim Centre (where I am studying) but I wasn’t sure who it was. When she arrived with designer glasses and book bag, I said to myself: she must be Iranian. She was. Engineers have a reputation of being nerds, but this reality never got into the Persian culture. In a region where good social skills are really expected, they’ve hit the ground running. Some have come to church with us; the observation of one that people left our church happy and the mosque sad is profound. Their opinion of this country is generally positive. One told me that his father had worked here in the 1970’s (before “the Revolution”, they, born after it, are amazed I remember it) and thought that it was a better country then than now (it was). Their opinion of their leadership in Tehran varies; some don’t talk about it and some are openly hostile. I got very sad when I heard about your loss, I remembered that you said she had a sad time because of her sickness, I know she is now in peace and rest and we are here for you as a good friend because you were like that for us always. When things have gotten frustrating (which in inevitable when you live and die by writing code) they’ve been an encouragement. Negotiation with any dictator is in vain, they smuggled 1 B $ in bank notes during the past month only , and this is reported to Mr. Kerry, a nuclear terrorist country is not approved even by other semi-terrorists countries like Russia, their religious leader is weeks away from death and his successor is a radical one, any deal might become a disaster for the entire world and mankind, they already started military drills in the Gulf and poured forces to Lebanon to use it as a leverage against Israel if needed. But we cannot seem to get past vacillating between rigid neocons and moralistic interventionist liberals, except when a critical mass of people get tired of being cannon fodder. Sometimes conspiracy theories bubble up, to which I say: our foreign policy is so stupid, conspiracy theories are the only rational explanations! 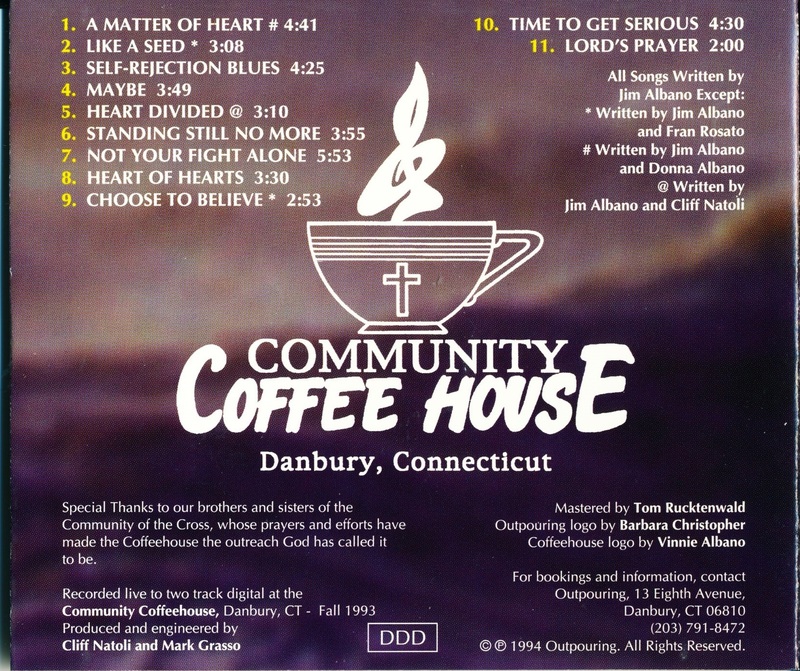 The coffee-house ministry was the gathering par excellence of the Jesus Music era. Although there are live recordings out there of concerts, coffee-house recordings are few and far between. This site features only two, both from Texas: the Answer (and that was a rehearsal) and the Latter Rain. And both of those were recorded from the floor, with all the reverberance to go with them. 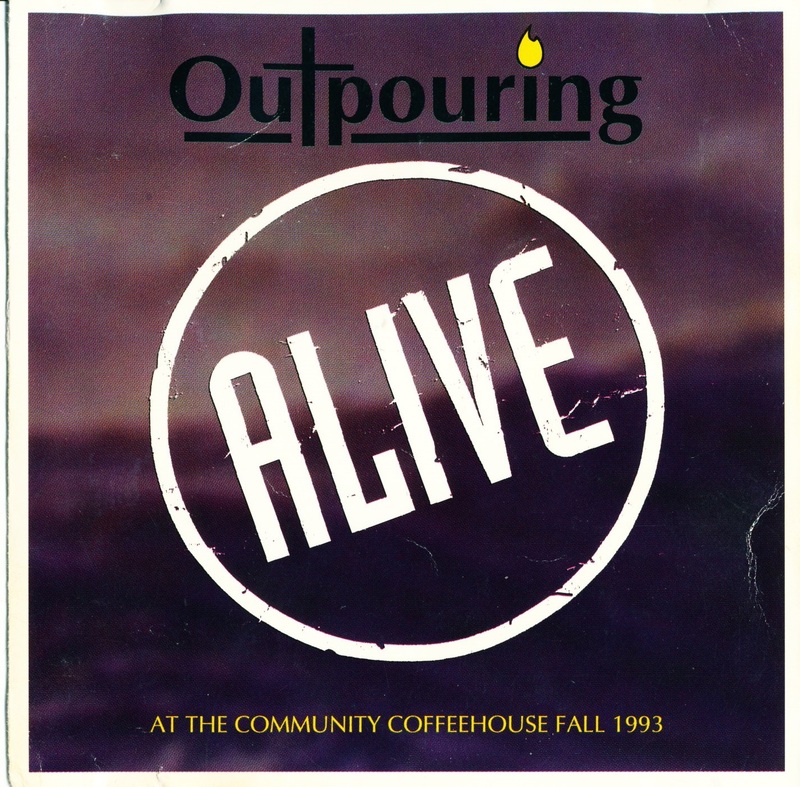 Outpouring is no stranger to this blog; their 1979 album is probably the most progressive American album on the site, although this and this are not far behind. It represented a push into the artistic, a push notoriously lacking in most American Christian music. And the music? It isn’t as “artsy” as the first album, and it’s more directly evangelistic than the first too. But it’s on a good level musically; there are some fun pieces, some jazzy ones, even a little country. It’s a great representation of the genre, one that is way too few and far between. Thanks to David for this music. Let us now return to ourselves. We are, we understand, we want. At first, to understand and to want, if it is something, it is not absolutely the same thing: if it is not something, it would not be anything, and there will be neither understanding nor wanting. But if it is absolutely the same thing, one does not distinguish them, but one does distinguish; because one understands what one does not want, which one does not love, besides what one cannot love or want something which one does not understand. God himself understands and knows what he does not love, like sin: and we, how many things do we understand that we hate and that we do not want to either do or allow, because we have understood that they will harm us? We understand about throwing oneself from the height of a tower, and this movement is not less understood than the others: but we do not want to do this, because it is harmful to us. We are thus something intelligent, something that understands oneself and loves oneself: who does not love what he understands, but who can know and understand that which he does not love: all the while in not loving it, he knows and understands that he does not love it, and that itself, he wants to know: and he does not want to love it, because he knows or he believes that it is harmful to him. Thus to understand and love are distinct things, but as such inseparable that there is no knowledge without some will. And if man like the Angel knows all that is, his knowledge would be equal to his being; and , loving himself in proportion to his knowledge, his love would be equal one to another. And if all this be well ruled, all of this would only act together as the same happiness of the same soul and truly the same happy soul: in that one which by the rectitude of his will conforms to the truth of his knowledge, she would be just. Thus these three things, to be, to know and to want make one particular soul happy and just, which either cannot either be without being known, or distract from oneself with losing his happiness entirely. Because what would be a soul which is without knowing, and what would it be without loving itself in the way which it must love itself to be truly happy, that is without loving by relationship with God, which is entirely the foundation of our happiness? Thus, in our imperfect and defective way, we set forth an incomprehensible mystery. A Trinity created which God made in our souls, sets forth to us the uncreated Trinity which he alone can show us: and, to set it forth in a better way, he has mixed in our souls which set it forth, something incomprehensible. We have seen that to understand and want, know and love are acts distinguished from each other: but are they so much so that they are entirely and substantially different things? This cannot be. Knowledge is nothing else than the substance of the soul affected in a certain fashion, and the will is nothing else than the substance of the soul affected by another. When I change either thought or will, do I have this want and this thought without my substance being there? Without doubt it is there: and, all of this is basically nothing else than my substance affected, diversified, modified in different ways, but basically always the same. For in changing thought, I do not change my substance; and my substance remains one, while my thoughts come and go: and while my will distinguishes itself from my soul from where it never leaves, likewise my knowledge goes distinguishing itself from my being from where it equally comes and that both, that is my knowledge and my will, distinguish themselves from each other in such ways and end up successively in diverse objects, my substance is always basically the same, although entering wholly into all different types of being. See already in me an inconceivable prodigy: but this prodigy extends in all nature. Movement and rest, things so distinct, are nothing at their root but substance which moves and rests; which changes in truth but not at its root, when it passes from movement to rest and from rest to movement. For that which moves now, it’s the same thing which will rest soon; and that which rests now, is the same thing which soon will be set in motion. And straight, zig-zag and circular movement are all different from each other, but they are only of the same substance: and a hundred successive arc motions of the same body are only the same body moved in a circle. All of this is distinct and one: one in substance, distinct in ways; and these very different ways only have the same subject, the same root, the same and only substance. I do not know who can claim to understand this perfectly: neither who can explain to oneself how these manners of being adjust to being; neither from whence their distinction in unity and identity comes when they have the same being; neither how they are things, neither how they are not things. They are things, otherwise if they were a pure nothing, one could truly neither affirm nor deny them; that which is not, in themselves, they cannot stand. All of this is hard to understand and nevertheless a true thing; and, all of this is a proof that as happens with natural things, unity is a principle of multiplicity in itself, and that unity and multiplicity are not as incompatible as one might think. O God, before whom I consider myself and am myself a great enigma! I have seen in me these three things, to be, to understand, to want. You want me to always exist, thus you have given me an immortal soul, whose happiness or misery will be eternal; and, if you want, I would always understand or want the same thing; for it is such that you want me to always be, when you make me happy by your presence. If I only want and understand eternally the same thing, that I am a single being, I will only have a single knowledge and a single will, where if one wants it a single understanding and a single will. Nevertheless my knowledge and my love or my will will be no less distinguished among themselves, neither less identified, that is to say will not be basically less in my being, with my substance. And my love or my will will be unable to not come from my knowledge; and, my love will always be something which comes from myself, and my knowledge will be no less from me; and always there will be in me three things, knowledge coming from being, knowledge coming forth, and love also coming from both. And if I be a nature incapable of all accident occurring to its substance, and in which it be necessary that all be substantial, my knowledge and my love would be something substantial and sustain; and I would be three subsistent persons in one substance; that is to say, I would be God. But because it is not so, I am only made in the image and likeness of God, and an imperfect sketch of this unique substance which is all together Father, Son and Holy Spirit: incomprehensible substance in its triune divinity which is basically only one thing, sovereign, immense, eternal, perfectly one in three persons distinctly subsistent, equal, consubstantial, to whom is due only one worship, one adoration, one love: since one cannot neither love the Father without loving his Son, nor love the Son without loving his Father, nor love them both without loving their eternal, subsistent union and their mutual love. And to help the faith which bonds me to this incomprehensible mystery, I see in myself a resemblance, imperfect though it is, does not allow something that I cannot understand; and, I am to myself an impenetrable mystery. And to take away all the pain of losing all my comprehension in God , I begin by losing it first, not only in all the works of nature, but also in myself more than the rest. God is thus fertile, God has a Son: but where is the Holy Spirit here, and where is the holy and perfect Trinity which we serve from our baptism onwards? Does not God love this Son and is he not loved? This love is neither imperfect nor accidental in God: the love of God is substantial, like his thought; and, the Holy Spirit who comes from the Father, from the Father and the Son, as their mutual love, is the same substance one to the other: a third consubstantial, and with them the same God. But why is he not Son, although he is by production the same nature? God has not revealed it. He has well said that the Son be unique, because he is perfect and all which is perfect is unique, and if he can have two sons, the generation of the son would be imperfect. All which came afterwards, will not be son, and will not come by generation, although of the same nature. What will thus be this last production of God? It is a procession, without a particular name: the Holy Spirit proceeds from the Father: the Holy Spirit is the common spirit of the Father and the Son: the Holy Spirit takes from the Son and the Son sends him like the Father. Human reasonings, shut up: God wanted to explain that the procession of his Word was a true and perfect generation: that which was the procession of his Holy Spirit, he did not want to say, except that there was nothing in nature which represented an action so substantial and entire and singular. It is a secret reserved for the happy vision. O God Holy Spirit, you are not Son, since you are the eternal love and subsistant of the Father and the Son: who supposes by consequence the generated Son, and generated like the unique Son because he is perfect. You are perfect also and unique in your genre, and in your order: you are not a foreigner to the Father and to the Son, since you are their mutual love: those you want to separate them, separate themselves one from another and divide their eternal reign. You are equal to the Father and to the Son, since we are equally consecrated in the name of the Father and the Son and the Holy Spirit, and you have with them, the same temple which is our soul, our body, all that we are. Nothing unequal nor foreign to the Father and the Son ought to be named with them in equality: I do not want to be baptised and consecrated in the name of a trustee. I do not want to be the temple of a creäture: this would be idolatry to build him a temple and, moreover, to be and believe oneself as his temple. I felt drawn to the Episcopal church because it offered some practices I felt were missing in my evangelical experience, like space for silence and reflection, a focus on Christ’s presence at the communion table as the climax and center of every worship service, opportunities for women in leadership, and the inclusion of LGBT people. When, as an Evangelical, she bounced from one rant to another, I thought, “She should become a Roman Catholic if she hates Evangelicalism so much, that would put things in a new perspective”. But that was asking too much, namely too high of a standard of belief. Thus the move to the Episcopal Church. That’s really the core of the problem: do you believe in the objective reality of Christianity or don’t you? It’s been that way since the days of John Shelby Spong and earlier but people like Held refuse to see it in those terms. Personally I think this is a relief for everyone, although I find it ironic that she, who is obsessed with making church attractive to Millennials, would end up in a church in a demographic death spiral as TEC is. But you just can’t make this stuff up. She also notes that “…I know plenty of folks who were raised Episcopalian who have become evangelical, drawn by the exciting and energetic worship or the emphasis on personal testimony and connection to Scripture.” Just down the road from her is another alternative, namely an ACNA church, which is doing fine, thank you. All of this is dead: the sun, its rays, its heat: a seal, its expression, an image either sculpted or painted. A mirror and the resemblances which object produce are dead things: God made an image most alive from his eternal and pure generation; and, to the end that we would be the most known, it is in ourselves that he has made it. He did it, when he said: Let us make man. He wanted to do something where the work of his son was declared, otherwise himself, then he said: Let us make. He wanted to make something which would be living like him, intelligent like him, holy like him, happy like him: otherwise, one would not know how to understand: Let us make man in our image and likeness. In our image, in the depths of his nature; in our likeness, by the conformity of his works with ours eternal and indivisible. It is by the result of this word: Let us make man in our image, that man thinks; and to think is to conceive: all thought is conception and expression of something: all thought is expression and by it a conception of the one who thinks it, if he who thinks to himself and hears himself; and, it would be a perfect conception and expression, eternal, substantial, if he who thinks be perfect, eternal, and if he be by his nature all substance, having nothing accidental in himself, neither anything which could be altered by his pure and unalterable intelligence. Thus God, who thinks substantially, perfectly, eternally, and who does not think, or can only think to himself, in thinking, conceives something substantial, perfect and eternal like himself: his birth, his eternal and perfect generation is there. Because the divine nature knows nothing imperfect; and there, conception cannot be separated from birth. It is thus that God is Father; it is thus that he gives birth to a Son who is equal to him; it is this eternal and perfect fertility whose excellence has swept us away, from the time when we are under the guidance of faith, we have dared to take our thought. To conceive and give birth in this way, it is to be the perfection of the original: and, to conceive and give birth as we do in our imperfect way, it is to be made in the image and likeness of God. We can thus answer now to Solomon’s question: Tell us his name and the name of his Son, if you can. We can now do it as he has taught us. His name is the Logos, the word: not a foreign or accidental word, God knows nothing of the kind; but a word which is in him a subsistent, cooperating, co-creating person, composing and arranging all things with him, as the same Solomon says: a person which did not begin, as Saint John says: In the beginning she was: a person who is one with God, then, says the same Saint John, she is God and that God is essentially one: a person who is nevertheless distinct from God, and then, continues the same Apostle, she is in God, with God, at God’s home, apud Deum: his only Son which is in his womb, in sinu Patris, which he sends to the world, which he makes to appear in the flesh as the only Son of God. Here is his name: it is the Logos, it is the word: the word, I say, by which an eternal and perfect God says to himself by himself all which he is, and conceives, generates and gives birth to all which he says, by consequence giving birth to a perfect, a co-eternal, co-essential and consubstantial being. Let us not find this mystery unworthy of God, as he does not attribute anything to himself which is not perfect; let us not find it unbelievable that God would show the mystery of his eternal generation to those whom he made to resemble him, in whom he had impressed a weak image of this eternal and perfect work. Let us be attentive to ourselves, to our conception, to our thought; we will find there an idea of this immaterial, incorporeal, pure and spiritual generation which the Gospel has revealed to us. Without this revelation, who would dare to cast his eyes on this admirable secret of God? But after faith, we not only dare to contemplate it, but to see in ourselves an image; we dare in some way to project into God this concept of our spirit and strip it of all alteration, of all change, of all imperfection. After this, nothing is left but the pure, perfect, incorporeal, intellectual birth of the Son of God; and, in his Father, a fertility worthy of the first being, by plentitude, by superabundance, by the infinity of a perfect and perfectly communicative nature, not only outside where all produced degenerates into infinity, because at the bottom, it comes from nothing and cannot lose the baseness of its origin; but also in itself where all which is produced of his substance and all his substance, is by necessity equal in all to him.